In the five years that ridesharing services like Uber and Lyft have operated in Canada, British Columbia has yet to see these global tech companies roll in. Now, that may be changing. Last November, the BC government introduced long-awaited legislation that would allow ridesharing companies to expand into the province by as early as fall of this year. Earlier this week, a nine-member, all-party standing committee on Crown corporations, released its recommendations for how ridesharing should be rolled out in BC. Uber, Lyft, and other interested parties have been carefully reading the fine print of last year’s legislation, as well as the recent recommendations. In that time, a fierce debate has raged between regulatory officials and industry players. BetaKit took a look at BC’s regulatory landscape for ridesharing to find out what’s preventing companies like Uber and Lyft from entering the BC market, as well as what these recent recommendations mean for the future of ridesharing in the province. Can ridesharing fix BC’s taxi shortage? BC has a taxi problem, and in recent months, BC’s transportation ministry has tried to provide relief to passengers asking for more taxis on the streets. The province’s transportation minister, Claire Trevena, told BetaKit that between October and December 2018, the Passenger Transportation Board (an independent tribunal), approved 433 additional taxis to operate in Metro Vancouver and throughout the province, attempting to fill the service gap. She called it a short-term fix to help taxi companies increase fleets by 15 percent. As the transportation ministry and taxi companies buckle under the demand for more taxis, one question has lingered: what about ridesharing? In 2012, Uber briefly launched in Vancouver before fleeing, after the Vancouver Taxi Association filed an injunction against the company. All ridesharing companies were later banned by the provincial government through several transportation regulations. Despite the new legislation that should allow ridesharing in BC, questions still remain on how services like Uber and Lyft will be allowed to operate in the province. Following this week’s recommendations, BC’s NDP Premier, John Horgan, re-emphasized the government’s plans to bring ridesharing to the province by the fall of 2019, noting that he’s confident it will happen within that timeline. However, the opposition Liberal party said it doesn’t expect the legislation will come into effect until spring 2020. Chow explained that the current debate on how ridesharing will be regulated in BC can be narrowed down to four potential impact areas: pricing, caps and boundaries, licences, and innovation. This week’s report made a total of 11 recommendations that addressed boundaries, numbers of vehicles, pricing, and driver’s licence requirements. It said no to class four licences, caps and boundaries, and yes to minimum pricing. The recommendations came as a windfall for ridesharing companies. The recommendations committee was not unanimous on driver licencing, but the majority voted for a class five licence requirement, instead of a class four. Uber and Lyft are hoping the government will approve ridesharing drivers with that standard class five passenger-vehicle driver’s licence. However, the government may still require drivers to obtain a class four commercial licence, which requires a special road test, medical exam, and vehicle inspection. Taxi drivers are already required to obtain this type of licence. After the committee released its recommendations, Trevena said she won’t budge on the requirement for class four licencing. “We are disappointed to see Transportation Minister, Claire Trevena, already speak out against one of the committee’s key recommendations to ensure drivers for ridesharing services don’t have to jump through a bunch of hoops and obtain special licences in order to provide rides,” the Ridesharing Now for BC coalition said. One solution the Liberal party has suggested is to allow ridesharing drivers to possess only a class five licence, but require them to undergo a criminal background check, receive regular vehicle inspections, and be identified if they receive driver misdemeanors. Trevena noted, however, that requiring class four is in line with ridesharing practices in places like Alberta and Nova Scotia. “Requiring additional or different licencing would, unnecessarily, keep people from driving with ridesharing services, and would limit the number of drivers available to provide rides,” Traci Lee, senior public policy manager at Lyft, told BetaKit. Taxi companies drove Uber out of the province, with 2014 legislation requiring licences for ridesharing. Mohan Kang, the president of the BC Taxi Association, a organization representing all commercial cab drivers in BC, said what troubles him the most about ridesharing companies like Uber and Lyft, is that in most jurisdictions, ridesharing drivers are not required to meet the same safety standards as taxi drivers. Having no safety regulations in place for commercial drivers could present a serious moral hazard, Chow noted. Drivers have, on the one hand, the objective of making money, as well as the obligation of keeping passengers safe. Chow expressed concern that, sometimes, drivers might make the wrong tradeoff. The legislative committee also recommended that ridesharing companies should have a minimum per-trip price that does not surpass the cost of public transit, (which can be anywhere from $2.95 for one transit zone, and $5.70 for three transit zones). One of the most attractive selling points for companies like Uber and Lyft is that they offer competitive prices for rides, and passengers are made aware of prices beforehand. The provincial government has, in the past, suggested it would require ridesharing to companies charge the same rates as taxis, essentially removing ridesharings’ most marketable pull. Lee said Lyft feels that government-imposed price controls essentially means ridesharing companies would not be able to provide dynamic pricing, which helps ensure drivers are available for passengers. The Ridesharing Now for BC coalition released its own summary recommending dynamic pricing, citing Metro Vancouver’s public transportation network operator TransLink, economist Dan Hara, and the Competition Bureau as experts behind the pricing recommendation. In this week’s report, the committee also recommended that boundaries should not be put in place for ridesharing. It suggested, however, that the province should consider alternatives to managing the allocation of vehicles, such as geo-fencing and per-trip or per-kilometre fees. The committee added that ridesharing companies should not be subjected to caps on the number of vehicles that can operate at any given time, but it did not settle on other means of dealing with supply and demand. Most major cities, apart from New York, do not place restrictions on the number of ridesharing drivers and, to date, no Canadian city has placed caps on ridesharing drivers from passing between municipal borders to pick up customers. The BC government, however, has suggested that it is considering restrictions in order to reduce congestion. Taxis currently abide by municipal operating boundaries, and therefore the BC Taxi Association has asked for the same rules for ridesharing. Uber and Lyft vigorously oppose this, but even the transportation minister has noted that the government doesn’t want to congest the streets with ridesharing vehicles. The BC Taxi Association told BetaKit that a lack of boundary restrictions could allow ridesharing drivers to “cherry-pick” customers, based on geographic location, but also based on other factors, like economic status, or disability. In testimony to the BC Select Standing Committee on Crown Corporations, Joseph Okpaku, vice president of public policy at Lyft, said fleet supply caps could mean long wait times and high fares for people in outlying neighbourhoods. “The compound effect of geographic boundaries and caps would make Lyft unreliable, which means more people will return to driving themselves home after a night out at a bar,” Okpaku claimed. Lee noted that placing geographic limits and caps could cause deadheading, a situation in which vehicles operate without carrying or accepting passengers. Dead mileage incurs costs for the driver through fuel use, earnings, and a reduction to the driver’s allowable time on the road. The gig economy has disrupted long-existing markets and aggravated well-established industries in hundreds of cities. North America’s west coast is exceptionally renowned for its tech-forward climate, with Uber and Lyft both headquartered in San Francisco. So why has Vancouver taken so long to follow suit? 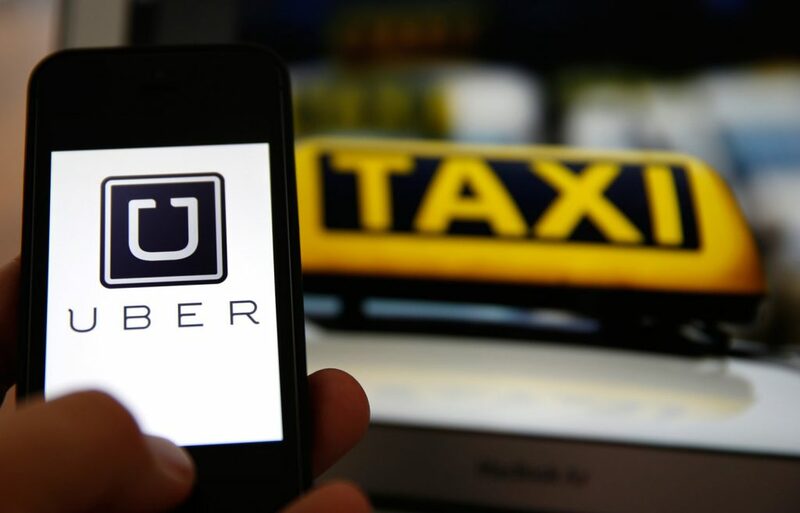 Earlier this month, the Federal Competition Bureau released a statement noting reasonable regulations and open markets should be the principal drivers behind the government’s attempt to accommodate both ridesharing and taxis. The agency called on the BC provincial government to reconsider its taxi regulations to encourage more competition and improve services for users. Chow said innovation comes when businesses change their processes and technology to provide better services, new services, or better productivity. Toronto, which has tens of thousands of ridesharing drivers, embraced this, much to the chagrin of taxi companies. In Quebec, Uber has hundreds of thousands of riders, with many operating in Montreal, despite the grumblings of taxi representatives in those cities. 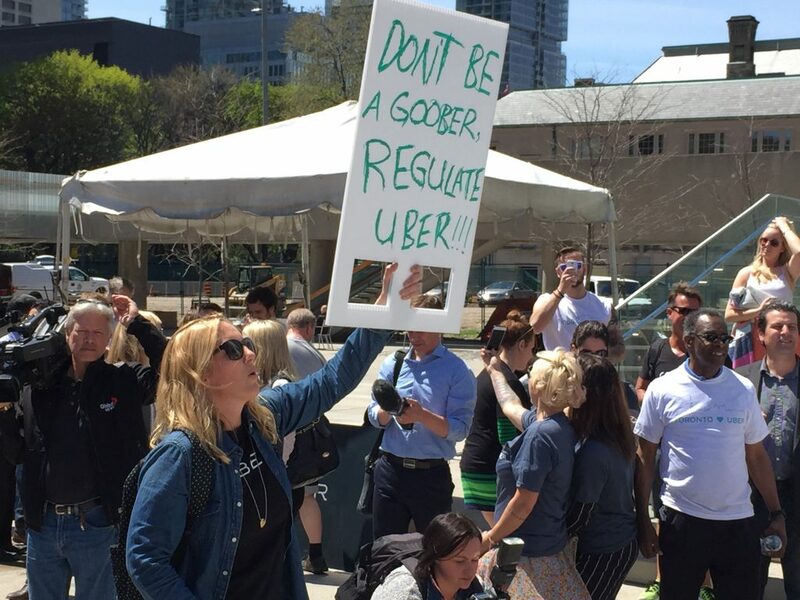 A 2015 rally in Toronto calling for the regulation of Uber in the city. For all the time that ridesharing has been shut out of the west coast province, the taxi industry has enjoyed a lion’s share of the commercial transportation market. Last July, in order to keep Uber and Lyft out, the Vancouver Taxi Association partnered with Surrey businessman, Monty Sikka, to develop a “ride-hailing” app called Kater. According to a letter of intent leaked to The Province, a reported 20 percent of the profits from the “ride-hailing” app will be going to the taxi firms. Kater’s CEO, Scott Larson, spoke to BetaKit several days before the app was set to begin beta testing in Vancouver. He said the company acquired 140 licences from the Vancouver Taxi Association. He also addressed a letter of intent, stating the Vancouver Taxi Association would receive a share of the profits generated by Kater. According to a public database that details political contributions made in British Columbia, the BC Taxi Association made $4,500 in political contributions to various political parties between 2005 and 2012. The Vancouver Taxi Association has also made over $160,000 worth of political contributions since 2005. The total amount donated by all taxi companies between 2005 and 2017 is $285,000. Carolyn Bauer, the spokesperson for the Vancouver Taxi Association, did not respond to multiple requests for comment prior to the publishing of this article. “I think people know who doesn’t want to ridesharing in BC – entrenched industry players who are focused on avoiding competition,” said Uber’s Khazzam. He noted that many people who drive on Uber are former taxi drivers and that it’s available to anyone. Lee said Lyft applauds the committee in recommending a regulatory structure that would bring ridesharing to BC. While the report’s recommendations represent a big win for ridesharing companies, there is no guarantee the NDP will implement them, especially with Trevena already holding strong against the licencing recommendations. The Liberal party is hoping the government will incorporate all these recommendations, but claims that with so much work left to do, suggested the spring of 2020 is a more likely deadline. Chow noted that there are some positives to BC going slow with ridesharing, as it gives the province the chance to learn from the successes and failures of other jurisdictions. As British Columbians wait for a finalized date, both Uber and Lyft are gearing up for BC expansion, continuing to lobby for a soft entrance into the province. Mohan Kang, is president of the BC Taxi Association, an “ASSOCIATION” that represents Taxi owners. There is no union representing commercial cab drivers in BC.